When we seek the direct source of the Green Man image in the Medieval period, we find that the oldest green man images of a familiar type yet discovered in the European tradition are Roman, from the centuries just before and after the time of Christ. Only a few images have so far been identified, but the growing interest in the subject willdoubtless reveal more and more of them. The Roman green men already known are all foliate heads, faces which transform into leaves around their edges, or faces composed of leaf forms. The earliest are mosaics from North Africa, but the most telling are the careved heads from Roman cemetary monuments at Neumagen, on the Mosel valley, and now in the museum at Trier. Some of the faces are squashed sideways, as if subsiding beneath the weight above. The image moved into another worldwhen used in the fourth century on the tomb of St Abre, not in the church of St Hillaire in Poitiers. 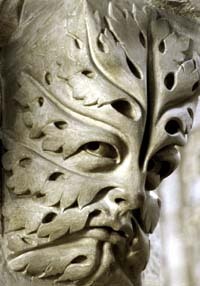 This was the first Christian green man, and the first of a new type, in which the foliage sprouts from the nose. This type became the most common during the Christian Middle Ages, except that it was more usual for the foliage to sprout from the mouth. Thousands of green men were put into churches during the Middle Ages, and although nothing was written about them, it is usually taken for granted that their use was symbolic, if in a more intuitive way than would be the case today. With the Renaissance the symbolic use appears to have declined, and the green man was used more as a conventional decorative motif. They are not uncommon in early Renaissance architecture, and then again in Classical buildings of the eighteenth and nineteen centuries, such as Queen Anne’s Gate in London, and the Place Vendome in Paris. With all other decoration they disappeared from modern architecture, but are now being revived in architecture, sculpture, and the other visual arts.